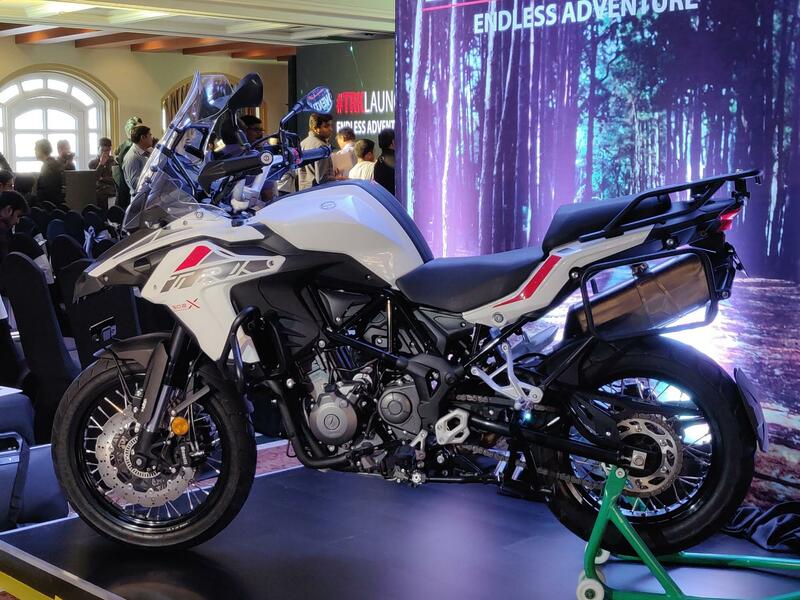 The Benelli TRK 502 and the Benelli TRK 502X have been launched in India, priced at INR 5 lakh and INR 5.40 lakh (ex-showroom Delhi), respectively. Interestingly, the prices are applicable only for online bookings, and dealership-level prices will vary. As compared to the standard model, the Benelli TRK 502X feature 19/17-inch wire-spoke wheels at the front and back and knobby off-road biased tyres. Customers can book the TRK 502 online from today, at an amount of INR 10,000. Furthermore, as part of a limited period over, customers will also avail a Benelli voucher worth INR 10,000, which can be used to purchase apparels and accessories from the dealership at the time of delivery. Dealership level bookings will commence after the online reservations are closed. The Benelli TRK 502 uses a steel trellis frame that adds lateral stiffness and should offer quick directional change. The motorcycle features a semi-fairing with a tall windscreen and split headlights with LED daytime running lights. The bike features a 20 litres fuel tank and step-up seats. We are delighted to launch the TRK range as the first adventure offering from Benelli in India. The launch of the TRK range is just the beginning and we are committed to bringing many more Benelli products through 2019. While the Benelli TRK 502X is a thoroughbred adventure tourer, the TRK 502 is a road-biased tourer. The TRK 502X features 19-inch front and 17-inch rear wire-spoke wheels with knobby 110/80-section front and 150/70-section rear Metzeler tyres. On the other hand, the TRK 502 comes with 17-inch alloy wheels at both the ends that come wrapped with 120/70 front and 160/60 rear tubeless Pirelli tyres. Powering the Benelli TRK 502 range is a 499.5cc, parallel-twin, DOHC, liquid-cooled, 8-valve engine that churns out a healthy 47 bhp of maximum power at 8,500 rpm and 46 Nm of peak torque that comes at 6,000 rpm. The motor is mated to a slick-shifting six-speed gearbox. 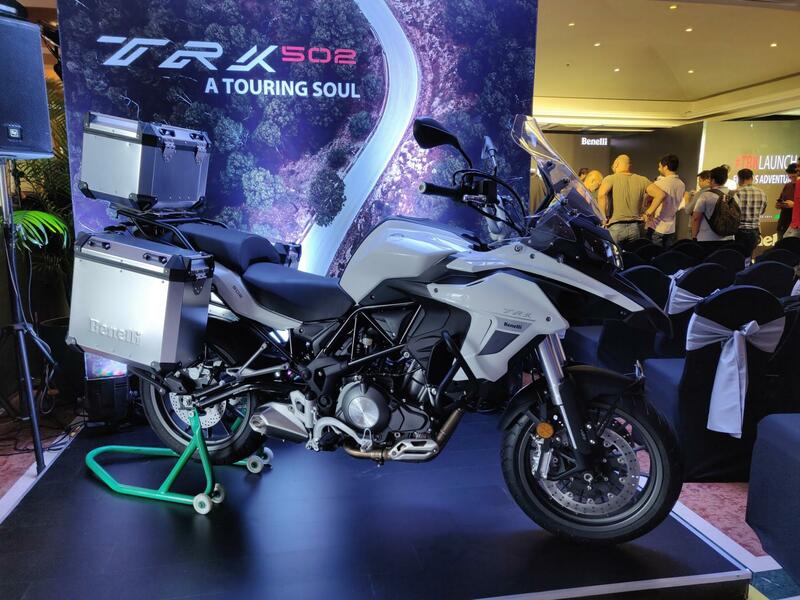 Both variants (Benelli TRK 502 pictured) will come with optional touring accessories like panniers and top-box. Suspension duties are performed by 50mm upside-down front forks, while the rear gets a vertically-mounted mono-shock. Braking hardware includes twin 320 mm disc up front and a single 260 mm rear disc brake, while switchable dual-channel ABS is standard.